Macrophages and their precursors, monocytes, are key cells involved in the innate immune response. Although both monocytes and macrophages produce caspase-1, the key enzyme responsible for pro-IL-1β processing; macrophages are limited in their ability to activate the enzyme and release functional IL-1β. In this context, because mutations in the pyrin gene (MEFV) cause the inflammatory disorder familial Mediterranean fever, pyrin is believed to regulate IL-1β processing. To determine whether variations in pyrin expression explain the difference between monocytes and macrophages in IL-1β processing and release, pyrin was studied in human monocytes and monocyte-derived macrophages. Although monocytes express pyrin mRNA and protein, which is readily inducible by endotoxin, monocyte-derived macrophages express significantly less pyrin mRNA and protein. Pyrin levels directly correlated with IL-1β processing in monocytes and macrophages; therefore, we asked whether pyrin might promote IL-1β processing and release. HEK293 cells were transfected with pyrin, caspase-1, apoptotic speck protein with a caspase recruitment domain, and IL-1β. Pyrin induced IL-1β processing and release in a dose-dependent manner. Conversely, pyrin small interference RNA suppressed pro-IL-1β processing in both THP-1 cells and fresh human monocytes. In summary, both pyrin expression and IL-1β processing and release are diminished upon the maturation of monocytes to macrophages. When pyrin is ectopically expressed or silenced, IL-1β processing and release parallels the level of pyrin. In conclusion, in the context of endotoxin-induced activation of mononuclear phagocytes, pyrin augments IL-1β processing and release. Caspase-1 regulation is central to the innate host response. Caspase-1 activation is required to generate the functional proinflammatory cytokines, IL-1β and IL-18 (1, 2, 3). It may also be required to process and activate a newly described cytokine IL-33 (4). However, the activation of caspase-1 is a highly regulated event that requires the assembly of several cytosolic proteins that are members of the NACHT-LRR family (NACHT-LRR-like receptors; Refs. 5, 6, 7, 8). This protein assemblage, termed the inflammasome, is likely to exist in varying formats depending on cell type and instigating factors (9, 10). In this context, one related protein, pyrin (marenostrin), has been postulated to provide a regulatory function within inflammasomes (11). Pyrin is an 86-kDa protein discovered as part of a genome-wide search for the cause of familial Mediterranean fever (FMF; Refs. 12 and 13). Pyrin contains an N-terminal pyrin domain (PYD)3 which is a member of the death domain family that promotes specific protein-protein interactions. The PYD of pyrin is believed to cooperate with other PYD-containing proteins within the inflammasome. Specifically, pyrin interacts with apoptotic speck protein, a 22-kDa adaptor protein that contains a PYD linked to a caspase recruitment domain (CARD) (14). Apoptotic speck protein with a CARD (ASC) knockout animals lack caspase-1 activation (15, 16). In agreement with the knockout data, ASC overexpression readily induces caspase-1 activation in HEK293 cells via an induced proximity mechanism that requires interaction between the CARD of caspase-1 and the CARD of ASC (17). Thus, it is hypothesized that the interaction of pyrin with ASC regulates the inflammasome structure and hence caspase-1 activation. In this context, there is controversy concerning the function of pyrin in the regulation of the inflammasome. Both an inhibiting and an activating function have been postulated (10, 11, 18, 19). However, the fact that pyrin mutations are associated with inflammatory responses lends itself to the concept that these mutations confer loss of function and that pyrin down-regulates the inflammasome function and hence, caspase-1 activation and IL-1β/IL-18-mediated innate responses. Given our longstanding interest in understanding differences in caspase-1 regulation between blood monocytes and tissue macrophages (20, 21, 22, 23), we elected to study the relative role of pyrin expression in these cells as it pertains to IL-1β processing and release. Although macrophages are derived from monocytes and contain abundant amounts of caspase-1, macrophages are limited in their ability to process 31-kDa pro-IL-1β to the active 17-kDa form (21, 22). Therefore, we sought to test the hypothesis that pyrin may be responsible for the differences in the inflammasome function between fresh blood monocytes and monocyte-derived macrophages. Our experiments examined the relative abundance of pyrin in monocytes and macrophages and the effect of modulating pyrin levels on caspase-1 activation and IL-1β processing and release. Human PBMCs were isolated from fresh source leukocytes from the American Red Cross. PBMCs were isolated with Histopaque-1077 density gradient. Monocytes were isolated by CD14+ selection (Miltenyi Biotec). This method yields >95% pure monocytes as confirmed by FACS. Monocytes were cultured in RPMI 1640 (Cambrex) supplemented with 5% FBS (endotoxin-free; HyClone) and with 1% penicillin-streptomycin solution. Monocyte-derived macrophages were generated by plating 2 × 107 PBMCs/ml in RPMI 1640 without serum. The cells were allowed to adhere for 2 h. The nonadherent cells were washed with PBS, and the cells were cultured in RPMI 1640 supplemented with 5% FBS and with 1% penicillin-streptomycin solution for 5 days. HEK293 (American Type Culture Collection; ATCC) cells were cultured in DMEM supplemented with 10% FBS and 1% penicillin-streptomycin solution. HEK293 cells were transfected with Lipofectamine 2000 (Invitrogen Life Technologies) per the manufacturer’s instructions. The total amount of DNA was kept constant in all transfections using the appropriate empty vector. THP-1 (ATCC) cells were cultured in RPMI 1640 supplemented with 10% FBS and 1% penicillin-streptomycin solution. THP-1 cells (10 × 106) were nucleofected with 5 μg of plasmid or 1 × 106 THP-1 cells were transfected using Lipofectamine 2000 with 100 pmol of small interference RNA (siRNA) according to the manufacturer’s instructions (Amaxa and Invitrogen Life Technologies). The complete open reading frame for pyrin was amplified from the cDNA of monocytes stimulated with LPS and cloned into pcDNA3.1 Myc/His-B (Invitrogen Life Technologies) with a C-terminal Myc/His tag. Plasmids encoding for pro-IL-1β, ASC, and caspase-1 were cloned into pEGFPC2 (BD Clontech) by amplifying from the cDNA of monocytes stimulated with LPS. The integrity of the plasmids was confirmed by sequencing. pEGFP-Pyrin plasmid was a gift from Dr. Deborah Gumucio (University of Michigan, Ann Arbor, MI). Pyrin was cloned into pMALC2X plasmid (New England Biolabs) with an N-terminal maltose-binding protein tag. Maltose-binding protein-pyrin fusion protein was expressed in Escherichia coli strain BL21DE3RIL (Stratagene). A major product of the column eluate was the maltose-binding protein with N terminus of the pyrin protein. The N terminus of the protein was confirmed by LC MS/MS mass spectrometry analysis (Campus Chemical Instrumentation Centre, Ohio State University, Columbus, OH). A rabbit was immunized with the purified fusion protein and the antisera recovered (Covance). Abs for Western blotting were from the following sources: ASC (rabbit polyclonal generated in our laboratory and monoclonal clone 23-4 from MBL International); caspase-1 (a gift from Dr. Douglas Miller, Merck Research Laboratories, Rahway, NJ); actin (monoclonal clone C4; MP Biomedicals); and IL-1β (rabbit polyclonal generated in our laboratory). Monocytes and monocyte-derived macrophages were lysed in Trizol (Invitrogen Life Technologies), and mRNA was extracted and converted into cDNA using Thermoscript RT-PCR systems (Invitrogen Life Technologies). The cDNA was used for qPCR using primers specific for pyrin. The values obtained by qPCR were normalized based on two housekeeping genes, CAP-1 and GAPDH, as previously described (24). For caspase-1 activity measurements using a fluorescent substrate, 2 × 106 cells were typically lysed in 100 μl of lysis buffer (50 mM HEPES (pH 7.4), 100 mM NaCl, 0.1% CHAPS, and 0.1 mM EDTA), supplemented with complete protease inhibitor mixture (Roche) for 20 min on ice, followed by centrifugation at 14,000 × g for 10 min at 4°C. Cell extracts (50 μl) were used in the assay. A detailed protocol has been described previously (25). Sandwich ELISAs developed in our laboratory were used to detect mature IL-1β, IL-8, and TNF-α as previously described (26, 27). Monocytes (2 × 106 cells) were lysed in cold lysis buffer (50 mM Tris-HCl (pH 8.0), 150 mM NaCl, 2 mM EDTA, and 1% Triton X-100) supplemented with complete protease inhibitor mixture (Roche) and 1 mM PMSF on ice for 20 min. Cell debris and nuclei were removed by centrifugation at 14,000 rpm at 4°C for 10 min. The protein concentrations in the cell extracts were determined using Bio-Rad Dc protein Lowry assay (Bio-Rad), and 10 μg of total protein per lane were resolved by 10% SDS-PAGE gel and transferred to a nitrocellulose membrane. Nonspecific sites on the nitrocellulose membrane were blocked with 5% nonfat dry milk (Carnation; Nestle) in 25 mM Tris-Cl (pH 7.5), 150 mM NaCl, and 0.05% Tween 20 for 2 h at room temperature. The membranes were probed with the appropriate primary Abs. Primary Abs were followed by peroxidase-conjugated secondary Abs as indicated, and protein bands were visualized by chemiluminescence (GE Healthcare). In some cases, membranes were probed with different Abs without stripping. siRNA for pyrin and control siRNA were purchased from Dharmacon RNA Technologies. THP-1 cells (1.0 × 106) were transfected with 100 pmol of siRNA using Lipofectamine 2000. After 3 days, the transfected cells were treated with 1.0 μg/ml LPS (E. coli strain 0127:B8, Westphal preparation, phenol extraction; Difco) for 6 h, and the cell culture medium was analyzed for IL-1β and IL-8 by ELISA. Cell lysates were analyzed for pyrin expression by immunoblot. Monocytes (10 × 106) were nucleofected with 500 pmol of siRNA according to the manufacturer’s instructions (Amaxa). After 18 h of nucleofection, the cells were stimulated with 1.0 μg/ml LPS for an additional 6 h. Cell culture medium was collected and analyzed for IL-1β and IL-8 by ELISA. Pyrin suppression was confirmed by Western blotting. Values are expressed as mean ± SEM. For comparisons, a standard paired t test was used, with significance defined as a p value of <0.05. To analyze the difference between monocytes and monocyte-derived macrophages in their ability to process IL-1β, monocytes and macrophages were stimulated with LPS (1.0 μg/ml), and IL-1β and TNF-α release was measured over a period of 24 h. Cell lysates at 0, 8, and 24 h were analyzed for pro-IL-1β, pyrin, caspase-1, and ASC expression. Mature IL-β was measured in the cell culture medium by ELISA. Although both monocytes and macrophages had similar pro-IL-1β, caspase-1, and ASC expression, monocytes released more IL-1β than did macrophages. (Fig. 1⇓, A and B). TNF-α measured in the cell culture medium (Fig. 1⇓C) indicated that the macrophages were capable of responding to LPS stimulation. Thus, macrophages are deficient in their ability to process and release IL-1β in response to LPS. Monocytes process and release IL-1β better than monocyte-derived macrophages. A, Fresh human monocytes were compared with monocytes (Mono) allowed to mature to macrophages (Macro) for 5 days. Fresh monocytes and macrophages were stimulated with LPS (1.0 μg/ml) for 0, 8, and 24 h. Lysates were collected and analyzed for the presence of IL-1β, caspase-1, ASC, and actin by immunoblot. D1 and D2 represent donor 1 and donor 2, respectively. B, Cell culture medium from the monocyte (▪) and macrophage (□) samples from four donors were analyzed by ELISA specific for mature IL-1β. C, Cell culture medium was also analyzed for TNF-α from monocytes (▪) and macrophages (□) to confirm ability to sense the endotoxin. Data represent the mean ± SEM of three donors. Because pyrin may be a regulator of caspase-1 activation and therefore IL-1β processing and release, we hypothesized that monocytes may differ in pyrin levels when compared with macrophages. First, we used qPCR to check the mRNA expression of pyrin in monocytes and macrophages. Fresh monocytes had increased pyrin mRNA as compared with macrophages (10.7 ± 1.9 vs 0.04 ± 0.02 relative copy numbers, respectively). Pyrin mRNA was induced ∼2-fold in monocytes but only slightly in macrophages after LPS (1.0 μg/ml) treatment (Fig. 2⇓A). Expression of pyrin is decreased in macrophages (Macro) compared with monocytes (Mono). A, Monocytes (2 × 106/ml) or macrophages were stimulated with LPS (1.0 μg/ml) for 0, 8, and 24 h and then lysed in TRIzol. RNA was extracted and transcribed into cDNA for quantitative PCR. The mRNA levels were referenced to the mean of the two housekeeping genes CAP-1 and GAPDH and expressed as relative copy numbers. Monocyte (▪) and macrophage (□) mRNA for pyrin is shown for the time points as the mean ± SEM of three donors. B, Pyrin rabbit antiserum is specific for human pyrin. Lysates from HEK293 cells transfected with pcDNA or pyrin pcDNA (two different protein concentrations) were compared with monocytes cultured for 4 h alone (NT) or with LPS (1.0 μg/ml). Shown is the immunoblot of the lysates. C, Pyrin is expressed in monocytes, and its expression is substantially decreased in macrophages. Monocytes and macrophages were stimulated with LPS (1.0 μg/ml) for 0, 8 or 24 h, then lysed and 10 μg of total protein electrophoresed in SDS-PAGE, transferred to nitrocellulose and blotted with anti-pyrin Ab. D1 and D2 represent donor 1 and donor 2, respectively. These are the membranes shown in Fig. 1⇑ now blotting for pyrin but using the same actin blot as the loading control. To determine whether the mRNA data matched protein production, we generated a polyclonal Ab to the N-terminal portion of pyrin. We used immunoblots to detect pyrin in HEK293 cells transfected with a pyrin-expressing plasmid and in fresh or LPS-stimulated monocytes to demonstrate the specificity of the antisera (Fig. 2⇑B). As shown in Fig. 2⇑C, monocytes expressed more pyrin than did macrophages. Thus, monocyte and macrophage pyrin levels matched the IL-1β release, which correlates with our original findings that monocytes quickly lose their IL-1β release capacity with time in culture (20). Our finding that monocytes express higher levels of pyrin than macrophages did led us to speculate a role of pyrin as an activator of caspase-1. To test this hypothesis, we used the HEK293 transfection system in which plasmids encoding caspase-1 and ASC were cotransfected with or without increasing amounts of pyrin. Cell lysates were subjected to caspase-1 activity assay 24 h after the transfection. Cells transfected with caspase-1 alone had minimal caspase-1 activity, whereas caspase activity was augmented by the addition of ASC and further induced by pyrin in a dose-dependent manner (Fig. 3⇓A). Pyrin increases caspase-1 activity and IL-1β processing and release in HEK293 cells. A, Caspase-1 activity. HEK293 cells were transfected with plasmids encoding for caspase-1 (0.1 μg), ASC (0.2 μg), and increasing doses of pyrin (0.005, 0.2, and 0.4 μg). The total DNA was kept constant at 0.7 μg by using pcDNA vector control. Caspase-1 activity was measured from cell pellets using Ac-WEHD-AMC, and results are presented as two independent experiments. The cell lysates from one representative experiment were blotted for caspase-1, ASC, and pyrin. B, IL-1β release. HEK293 cells were transfected with plasmids encoding for pro-IL-1β (0.15 μg), caspase-1 (0.05 μg), ASC (0.2 μg), and with or without pyrin (0.005, 0.05, 0.15, and 0.3 μg). Cell culture media were harvested 24 h after the transfection, and IL-1β was measured by ELISA. Data are the mean ± SEM of three independent experiments. 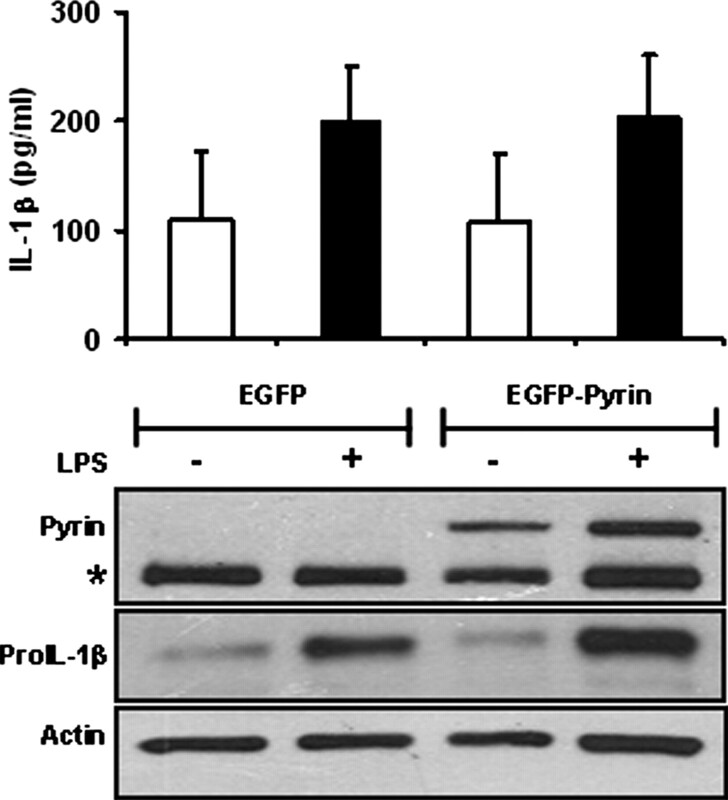 The cell lysates from one representative experiment were blotted for pyrin, pro-IL-1β and ASC. To further test whether pyrin increased the processing and release of pro-IL-1β to mature IL-1β, we used the HEK293 transfection system in which plasmids encoding pro-IL-1β, procaspase-1, and ASC were cotransfected with or without pyrin (Fig. 3⇑B). Released IL-1β was measured 24 h later in the cell culture medium. As shown, when pyrin was cotransfected with ASC (0.2 μg plasmid), caspase-1 was further activated, and increased amounts of processed IL-1β were released. This pyrin enhancement behaved in a dose-response manner. Increasing pyrin expression was associated with diminished intracellular pro-IL-1β and ASC protein expression (Fig. 3⇑B) presumably due to their activation-induced release, as has been shown previously (15), although decreased solubility due to overexpression of these proteins cannot be excluded. In an effort to confirm the specificity of the pyrin overexpression findings, we next asked whether a lower dose of ASC would have the same effect on IL-1β release with pyrin overexpression. Fig. 4⇓A shows that the augmentation of pyrin was present with ASC expression using only 0.05 μg of ASC plasmid. Low dose of ASC also supports pyrin induced IL-1β processing and release. IL-1β release was compared in response to two pyrin expression plasmids (pcDNA3.1Myc/His and pEGFPC2N1). A, pcDNA-pyrin: HEK293 cells were transfected with plasmids encoding for pro-IL-1β (0.15 μg), caspase-1 (0.05 μg), ASC (0.05 μg), and with or without pcDNA-pyrin (0.05, 0.10, and 0.45 μg). Cell culture media were harvested 24 h after the transfection, and IL-1β was measured in the cell culture medium by ELISA. Data are presented as the mean ± SEM of three independent experiments. ND, Cytokine levels not detectable by ELISA. The cell lysates from one representative experiment were blotted for pyrin, ASC, caspase-1, and pro-IL-1β. ∗, Nonspecific band; B, pEGFP-pyrin. To confirm the specificity of pyrin transfection on IL-1β processing and release, pEGFP-pyrin plasmid was also used. Transfection was conducted using the above protocol. The cell lysates from one representative experiment were blotted for pyrin, ASC, caspase-1, and pro-IL-1β. We were concerned that the pyrin overexpression might be inducing IL-1β release in response to injury to the cells due to the nonspecific effect of overexpressing a protein in HEK293 cells. To test this hypothesis, we next used the pEGFP-pyrin plasmid with the pEGFP plasmid control. In this case, all experimental cells would be experiencing protein overexpression. As shown in Fig. 4⇑B, pEGFP-pyrin also induced enhanced IL-1β release from HEK293 cells. However, when pEGFP (without pyrin) was expressed with ASC, caspase-1, and pro-IL-1β, caspase-1 activation and IL-1β processing and release were not induced (Fig. 4⇑B, lane 3). To determine whether pyrin is capable of regulating IL-1β production in response to a physiologically relevant stimulus, we nucleofected THP-1 monocytic cells with pEGFP-pyrin plasmid or the pEGFP plasmid control (Fig. 5⇓). Although after 6 h the THP-1 cells expressed the EGFP-pyrin protein, LPS (10 μg/ml) stimulation for an additional 18 h did not induce a differential release of pyrin in response to the increased pyrin expression. The lack of an effect of pyrin overexpression here is unexplained but may be due to the fact that THP-1 cells already express high levels of pyrin. We therefore chose to test the suppression of pyrin in response to LPS. Pyrin overexpression does not suppress IL-1β processing and release in THP-1 cells. THP-1 cells were nucleofected with plasmid encoding pyrin (EGFP-pyrin) or the plasmid control (EGFP). Six hours after nucleofection, the cells were stimulated with LPS (10 μg/ml) for 18 h. Cell culture media were analyzed for IL-1β by ELISA and lysates subjected to immunoblots with Ab for pyrin, IL-1β, and actin. IL-1β data are the mean ± SEM of four independent experiments. Blots are from one representative experiment. ∗, Endogenous pyrin. If pyrin is an activator of IL-1β processing and release, then pyrin knockdown should inhibit IL-1β processing and release. Therefore, we transfected THP-1 cells using Lipofectamine 2000 with pyrin or control siRNA. Three days after transfection, the cells were stimulated with LPS (1.0 μg/ml) for 6 h. IL-1β and IL-8 release was measured by ELISA. 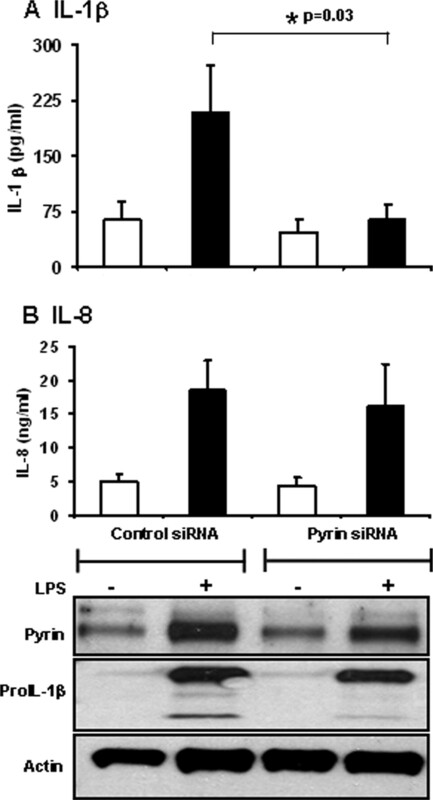 In support of the role of pyrin as an activator of IL-1β, suppression of pyrin by siRNA significantly decreased IL-1β release in THP-1 cells, p = 0.05 (Fig. 6⇓). The IL-1β was suppressed ∼40% in THP-1 cells treated with pyrin siRNA as compared with the control siRNA-treated cells. Pyrin siRNA decreased pyrin protein levels in lysates. However, suppression of pyrin had no effect on IL-8, a cytokine that does not require processing or inflammasome activation for its function. As a control for siRNA, ASC, another PYD-containing protein, was not affected by pyrin siRNA. Importantly, the pyrin siRNA did not affect intracellular pro-IL-1β levels (i.e., the substrate for caspase-1 was not limited). Knockdown of pyrin suppresses IL-1β release in THP-1 cells. THP-1 cells were transfected with control siRNA or pyrin siRNA and 3 days later stimulated with LPS (1.0 μg/ml) for 6 h. The cell culture media were analyzed for IL-1β (A) and IL-8 (B) by ELISA. In addition, the lysates were analyzed by immunoblotting for pyrin, IL-1β, and actin. Data represent mean ±SEM for three independent experiments. ND, Cytokine levels not detectable by ELISA. Blots are from one representative experiment. To further corroborate the THP-1 studies, we nucleofected human PBMCs with control siRNA or pyrin siRNA in seven donors. Monocytes were allowed to recover for 18 h and were then stimulated with LPS (1.0 μg/ml) for an additional 6 h. Cell culture medium was analyzed for IL-1β and IL-8 by ELISA. 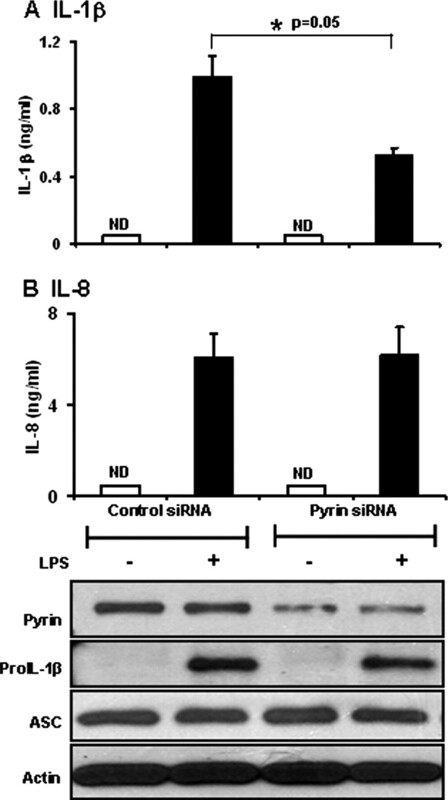 Pyrin siRNA suppressed intracellular pyrin levels, and IL-1β release was also diminished (208 ± 64 vs 62 ± 21 pg/ml, p = 0.03; Fig. 7⇓). Again, suppression of pyrin did not affect IL-8. Knockdown of pyrin suppresses IL-1β release in PBMCs. PBMCs were nucleofected with control or pyrin siRNA and allowed to incubate for 18 h before stimulation with LPS (1.0 μg/ml) for 6 h. Cell culture medium and lysates were analyzed as in Fig. 6⇑. Data are the mean ± SEM of seven donors for IL-1β (A) and mean ± SEM of four donors for IL-8 (B). Blots are from one representative donor. Of the novel intracellular sensors and regulators of the innate immune response, pyrin is one that has been genetically linked to human disease. Pyrin/marenostrin was discovered as the gene MEFV during a genome-wide screen for the cause of FMF (12, 13). FMF is a genetically recessive disease characterized by recurrent self limited episodes of fever and localized inflammation affecting the serosal membranes, joints, and skin and sometimes leading to systemic amyloid A amyloidosis (28). In this context, the function of pyrin remains controversial although it is generally held to be an inhibitor of the function of the inflammasome via its ability to disrupt ASC-caspase-1 interactions (11, 19). Therefore we sought to study the role of pyrin as a potential regulator of caspase-1 activation in monocytes and macrophages which differ substantially in their relative abilities to activate caspase-1 and process and release IL-1β (20, 21, 22). As background information it is important to summarize what is known about pyrin function. Yeast two-hybrid analysis of pyrin indicates that pyrin interacts with an adaptor protein, ASC (14). The N-terminal PYD domains of ASC and pyrin mediate the interaction. ASC causes the oligomerization of caspase-1 which induces its activation and the cleavage of procaspase-1 to mature caspase-1 (15, 29, 30). It has previously been shown that pyrin-deficient macrophages produce more IL-1β when stimulated with IL-4, LPS, or the combination as compared with the wild type (11). Pyrin-deficient macrophages had higher levels of activated caspase-1. Pyrin interacts with ASC (an activator of caspase-1) through its N-terminal pyrin domain. One hypothesis is that wild-type pyrin blocks the caspase-1- ASC interaction and thus prevents the activation of caspase-1 and subsequent cleavage of pro-IL-1β. We initially hypothesized that if pyrin is an inhibitor of caspase-1 activation, then macrophage levels of pyrin should be high compared with monocytes. We show that both monocytes and macrophages produce the caspase-1 substrate, pro-IL-1β, and we have previously documented that, although macrophages contain sufficient caspase-1, they are deficient in processing IL-1β (20, 23). Therefore, we predicted high pyrin levels in the macrophages. Unexpectedly, pyrin levels by quantitative PCR and by immunoblots of cell lysates were low in monocyte-derived macrophages but easily detectable in fresh human monocytes and monocytic cell line THP-1 cells. As previously shown, monocyte-derived macrophages were shown to be limited in their ability to process and release IL-1β, the classic product of caspase-1 activation. Thus, we modified our original hypothesis to ask whether pyrin may function to enhance the activation of caspase-1, a concept that has recently been proposed (20). To test this we used pyrin overexpression in HEK293 cells and THP-1 cells and pyrin knockdown experiments in THP-1 cells and human monocytes to analyze the role of pyrin in caspase-1 activation. The model tested these systems, in response to the TLR4 stimulus, phenol extracted E. coli LPS. In agreement with the role of pyrin as a positive regulator of caspase-1, HEK293 cells transfected with increasing amounts of pyrin showed an up-regulation of caspase-1 activity and IL-1β release that correlated with the pyrin dose (Figs. 3⇑ and 4⇑). Consistent with the concept of pyrin as an activator, a decrease of IL-1β release was seen in both THP-1 cells and human monocytes in which pyrin had been knocked down with pyrin siRNA (Figs. 6⇑ and 7⇑). However, this enhancing effect of pyrin was not substantiated in THP-1 cells overexpressing pyrin (Fig. 5⇑). This apparent discrepancy may be explained by the possibility that THP-1 cells have more than sufficient baseline pyrin levels the function of which cannot be further enhanced by further increases. Thus, in summary, pyrin levels decrease with differentiation of monocytes to macrophages and IL-1β processing and release decreases in conjunction with these changes in pyrin. We are the first to demonstrate a function for pyrin in fresh human monocytes and to document pyrin changes with monocyte differentiation. At the very least, in mononuclear phagocytes that are responding to a TLR4 stimulus, our data suggest that pyrin is not an inhibitor of IL-1β processing and release. However, that pyrin can activate IL-1β release differs from the prior report that pyrin is suppressive (11). In this context, it should be noted that murine pyrin differs substantially from human pyrin. Murine pyrin lacks the C-terminal B30.2 domain of human pyrin which may at least partially explain this difference (31). The magnitude of the pyrin change with monocyte to macrophage differentiation is large and correlates well with the magnitude of the change seen with IL-1β release during differentiation. However, the magnitude of the IL-1β change seen with pyrin overexpression in HEK293 cells is relatively modest. This raises the distinct possibility that there are other changes with inflammasome-related proteins during monocyte-to-macrophage differentiation that may further complicate the issue. For example, using q PCR we have studied the expression of other inflammasome genes including NALP-1, NALP-3, and ASC in monocytes and macrophages. In addition, we have generated a polyclonal Ab to ASC in an effort to delve more deeply into this question. By qPCR, we find a decrease in mRNA of NALP-1 and NALP-3 from monocyte-to-macrophage differentiation. In contrast, the level of ASC mRNA is increased in macrophages compared with monocytes, but there was no significant difference in ASC protein expression (as shown in Fig. 1⇑A). Recently, Kummer et al. (32) have shown that NALP-1 and NALP-3 protein levels are very low in monocytes but high in THP-1 cells. Therefore, if pyrin is cooperating with NALP-1 or NALP-3 or ASC for the activation of caspase-1, the situation may be complex. That is, pyrin levels are likely to be only a part of the monocyte and macrophage difference. Furthermore, the complexity is further documented by the finding that pyrin has been suggested to be a suppressor of IL-1β (19). In a major report that contradicts our findings, published after our manuscript was submitted, Chae et al. (19) focused their attention to pyrin experiments in cells that do not contain ASC (i.e., PT67 cells derived from fibroblasts). This choice was to avoid the complication that ASC interacts with both pyrin and caspase-1 (19). These ASC-deficient cells do show a depression of IL-1β release in response to high levels of pyrin transfections (19). Because our model was done with ASC sufficiency, we suspect that the ratio of ASC to pyrin and caspase-1 may be critical to determine the ultimate fate of pyrin in the ASC-mediated caspase-1 activation that is central to most caspase-1 activation reports (15, 33). It is important to relate our findings to the condition of patients with FMF. Because FMF is characterized by spontaneous bouts of inflammation and fever, and because our data suggest that pyrin regulates IL-1β in a positive manner, the mutations associated with FMF may be gain of function mutations. The mutations may provide a selective advantage that increases the inflammatory response to a particular infectious challenge. Just as cryopyrin has recently been linked to ATP, bacterial DNA, Staphylococcus, Listeria, and uric acid crystals (34, 35, 36), pyrin may have its own specificities. In this context, it is important to keep in mind that our data are centered only on one type of infectious challenge, the response to exogenous LPS. It is possible that pyrin represents a positive regulator in the context of LPS but a negative regulator of inflammation in the context of other types of infectious challenges, e.g., from an intracellular pathogen. Our future studies are directed at this question. Another interpretation of our results is that the regulation of IL-1β processing by pyrin may not be the main function of pyrin. Indeed, pyrin may regulate other aspects of inflammation. It is well known that ASC, the binding partner of pyrin, can regulate apoptosis and also may determine, in part, the relative activation of NFκB (37). Thus, pyrin may be able to modify inflammation independently of IL-1β via its ability to activate NFκB levels and hence the transcription of many inflammatory cytokines. Another potential function of pyrin is related to pyrin as a member of the tripartite motif family of proteins. It is possible that pyrin interacts directly with intracellular pathogens as has been implied by the pyrin homolog tripartite motif 5α, which impairs transcription of HIV-1 (38). Lastly, pyrin may play important roles in other aspects of pathogen recognition such as phagocytosis. Pyrin is known to interact with actin and microtubules (39), and recently pyrin has been shown to be part of the Wiskott-Aldrich syndrome protein complex via its interaction with proline-serine-threonine phosphatase interacting protein 1 (40). Thus, pyrin may have multiple functions, and the FMF mutations may provide a number of modifications in the innate host response beyond the regulation of caspase-1. In summary, pyrin protein levels are down-regulated in monocytes as they mature into monocyte-derived macrophages. These changes occur at the same time that IL-1β processing and release is also down-regulated. Because knockdown of pyrin levels in monocytes is associated with a decrease in IL-1β processing and release, pyrin may function to augment caspase-1 activation events in some innate host response settings. We thank Raquel Raices for critical reading of the manuscript. ↵1 This work was supported by National Institutes of Health Grants HL40871 and HL76278. ↵3 Abbreviations used in this paper: PYD, N-terminal pyrin domain; FMF, familial Mediterranean fever; CARD, caspase recruitment domain; ASC, apoptotic speck protein with a CARD; siRNA, small interference RNA; qPCR, quantitative PCR. Cerretti, D. P., C. J. Kozlosky, B. Mosley, N. Nelson, K. Van Ness, T. A. Greenstreet, C. J. March, S. R. Kronheim, T. Druck, L. A. Cannizzaro, et al 1992. Molecular cloning of the interleukin-1β converting enzyme. Science 256: 97-100. Ghayur, T., S. Banerjee, M. Hugunin, D. Butler, L. Herzog, A. Carter, L. Quintal, L. Sekut, R. Talanian, M. Paskind, et al 1997. Caspase-1 processes IFN-γ-inducing factor and regulates LPS-induced IFN-γ production. Nature 386: 619-623. Schmitz, J., A. Owyang, E. Oldham, Y. Song, E. Murphy, T. K. McClanahan, G. Zurawski, M. Moshrefi, J. Qin, X. Li, et al 2005. IL-33, an interleukin-1-like cytokine that signals via the IL-1 receptor-related protein ST2 and induces T helper type 2-associated cytokines. Immunity 23: 479-490. Inohara, N., G. Nunez. 2003. NODs: intracellular proteins involved in inflammation and apoptosis. Nat. Rev. Immunol. 3: 371-382. Chamaillard, M., S. E. Girardin, J. Viala, D. J. Philpott. 2003. Nods, Nalps and Naip: intracellular regulators of bacterial-induced inflammation. Cell Microbiol. 5: 581-592. Ting, J. P., K. L. Williams. 2005. The CATERPILLER family: an ancient family of immune/apoptotic proteins. Clin. Immunol. 115: 33-37. Martinon, F., J. Tschopp. 2005. NLRs join TLRs as innate sensors of pathogens. Trends Immunol. 26: 447-454. Martinon, F., K. Burns, J. Tschopp. 2002. The inflammasome: a molecular platform triggering activation of inflammatory caspases and processing of proIL-1β. Mol. Cell. 10: 417-426. Yu, J. W., J. Wu, Z. Zhang, P. Datta, I. Ibrahimi, S. Taniguchi, J. Sagara, T. Fernandes-Alnemri, E. S. Alnemri. 2005. Cryopyrin and pyrin activate caspase-1, but not NF-κB, via ASC oligomerization. Cell Death Differ. 13: 236-249. Chae, J. J., H. D. Komarow, J. Cheng, G. Wood, N. Raben, P. P. Liu, D. L. Kastner. 2003. Targeted disruption of pyrin, the FMF protein, causes heightened sensitivity to endotoxin and a defect in macrophage apoptosis. Mol. Cell. 11: 591-604. Ancient missense mutations in a new member of the RoRet gene family are likely to cause familial Mediterranean fever: the International FMF Consortium. Cell 90: 1997797-807. A candidate gene for familial Mediterranean fever: the French FMF Consortium. Nat. Genet. 17: 199725-31. Richards, N., P. Schaner, A. Diaz, J. Stuckey, E. Shelden, A. Wadhwa, D. L. Gumucio. 2001. Interaction between pyrin and the apoptotic speck protein (ASC) modulates ASC-induced apoptosis. J. Biol. Chem. 276: 39320-39329. Mariathasan, S., K. Newton, D. M. Monack, D. Vucic, D. M. French, W. P. Lee, M. Roose-Girma, S. Erickson, V. M. Dixit. 2004. Differential activation of the inflammasome by caspase-1 adaptors ASC and Ipaf. Nature 430: 213-218. Yamamoto, M., K. Yaginuma, H. Tsutsui, J. Sagara, X. Guan, E. Seki, K. Yasuda, M. Yamamoto, S. Akira, K. Nakanishi, et al 2004. ASC is essential for LPS-induced activation of procaspase-1 independently of TLR-associated signal adaptor molecules. Genes Cells 9: 1055-1067. Stehlik, C., S. H. Lee, A. Dorfleutner, A. Stassinopoulos, J. Sagara, J. C. Reed. 2003. Apoptosis-associated speck-like protein containing a caspase recruitment domain is a regulator of procaspase-1 activation. J. Immunol. 171: 6154-6163. Centola, M., G. Wood, D. M. Frucht, J. Galon, M. Aringer, C. Farrell, D. W. Kingma, M. E. Horwitz, E. Mansfield, S. M. Holland, et al 2000. The gene for familial Mediterranean fever, MEFV, is expressed in early leukocyte development and is regulated in response to inflammatory mediators. Blood 95: 3223-3231. Chae, J. J., G. Wood, S. L. Masters, K. Richard, G. Park, B. J. Smith, D. L. Kastner. 2006. The B30.2 domain of pyrin, the familial Mediterranean fever protein, interacts directly with caspase-1 to modulate IL-1β production. Proc. Natl. Acad. Sci. USA 103: 9982-9987. Wewers, M. D., S. I. Rennard, A. J. Hance, P. B. Bitterman, R. G. Crystal. 1984. Normal human alveolar macrophages obtained by bronchoalveolar lavage have a limited capacity to release interleukin-1. J. Clin. Invest. 74: 2208-2218. Wewers, M. D., D. J. Herzyk. 1989. Alveolar macrophages differ from blood monocytes in human interleukin 1β release: quantitation by enzyme linked immunoassay. J. Immunol. 143: 1635-1641. Herzyk, D. J., J. N. Allen, C. B. Marsh, M. D. Wewers. 1992. Macrophage and monocyte IL-1β regulation differs at multiple sites: messenger RNA expression, translation and post-translational processing. J. Immunol. 149: 3052-3058. Wewers, M. D., H. A. Dare, A. V. Winnard, J. M. Parker, D. K. Miller. 1997. IL-1β-converting enzyme (ICE) is present and functional in human alveolar macrophages: macrophage IL-1β release limitation is ICE independent. J. Immunol. 159: 5964-5972. Gavrilin, M. A., I. J. Bouakl, N. L. Knatz, M. D. Duncan, M. W. Hall, J. S. Gunn, M. D. Wewers. 2006. Internalization and phagosome escape required for Francisella to induce human monocyte IL-1β processing and release. Proc. Natl. Acad. Sci. USA 103: 141-146. Kim, H. J., J. Hart, N. Knatz, M. W. Hall, M. D. Wewers. 2004. Janus kinase 3 down-regulates lipopolysaccharide-induced IL-1β-converting enzyme activation by autocrine IL-10. J. Immunol. 172: 4948-4955. Herzyk, D. J., A. E. Berger, J. N. Allen, M. D. Wewers. 1992. Sandwich ELISA formats designed to detect 17 kDa IL-1β significantly underestimate 35 kDa IL-1β. J. Immunol. Methods 148: 243-254. Marsh, C. B., J. E. Gadek, G. C. Kindt, S. A. Moore, M. D. Wewers. 1995. Monocyte Fcγ receptor cross-linking induces IL-8 production. J. Immunol. 155: 3161-3167. Drenth, J. P. H., J. W. M. van der Meer. 2001. Hereditary periodic fever. N. Engl. J. Med. 345: 1748-1757. Srinivasula, S. M., J. L. Poyet, M. Razmara, P. Datta, Z. Zhang, E. S. Alnemri. 2002. The PYRIN-CARD protein ASC is an activating adaptor for caspase-1. J. Biol. Chem. 277: 21119-21122. Sarkar, A., M. Duncan, J. Hart, E. Hertlein, D. C. Guttridge, M. D. Wewers. 2006. ASC directs NF-κB activation by regulating receptor interacting protein-2 (RIP2) caspase-1 interactions. J. Immunol. 176: 4979-4986. Chae, J. J., M. Centola, I. Aksentijevich, A. Dutra, M. Tran, G. Wood, K. Nagaraju, D. W. Kingma, P. P. Liu, D. L. Kastner. 2000. Isolation, genomic organization, and expression analysis of the mouse and rat homologs of MEFV, the gene for familial Mediterranean fever. Mamm. Genome 11: 428-435. Kummer, J. A., R. Broekhuizen, H. Everett, L. Agostini, L. Kuijk, F. Martinon, R. van Bruggen, J. Tschopp. 2007. Inflammasome components NALP 1 and 3 show distinct but separate expression profiles in human tissues, suggesting a site-specific role in the inflammatory response. J. Histochem. Cytochem. 55: 443-452. Faustin, B., L. Lartigue, J. M. Bruey, F. Luciano, E. Sergienko, B. Bailly-Maitre, N. Volkmann, D. Hanein, I. Rouiller, J. C. Reed. 2007. Reconstituted NALP1 inflammasome reveals two-step mechanism of caspase-1 activation. Mol. Cell. 25: 713-724. Martinon, F., V. Petrilli, A. Mayor, A. Tardivel, J. Tschopp. 2006. Gout-associated uric acid crystals activate the NALP3 inflammasome. Nature 440: 237-241. Mariathasan, S., D. S. Weiss, K. Newton, J. McBride, K. O’Rourke, M. Roose-Girma, W. P. Lee, Y. Weinrauch, D. M. Monack, V. M. Dixit. 2006. Cryopyrin activates the inflammasome in response to toxins and ATP. Nature 440: 228-232. Kanneganti, T. D., N. Ozoren, M. Body-Malapel, A. Amer, J. H. Park, L. Franchi, J. Whitfield, W. Barchet, M. Colonna, P. Vandenabeele, et al 2006. Bacterial RNA and small antiviral compounds activate caspase-1 through cryopyrin/Nalp3. Nature 440: 233-236. Stehlik, C., L. Fiorentino, A. Dorfleutner, J. M. Bruey, E. M. Ariza, J. Sagara, J. C. Reed. 2002. The PAAD/PYRIN-family protein ASC is a dual regulator of a conserved step in nuclear factor κB activation pathways. J. Exp. Med. 196: 1605-1615. Stremlau, M., C. M. Owens, M. J. Perron, M. Kiessling, P. Autissier, J. Sodroski. 2004. The cytoplasmic body component TRIM5α restricts HIV-1 infection in Old World monkeys. Nature 427: 848-853. Mansfield, E., J. J. Chae, H. D. Komarow, T. M. Brotz, D. M. Frucht, I. Aksentijevich, D. L. Kastner. 2001. The familial Mediterranean fever protein, pyrin, associates with microtubules and colocalizes with actin filaments. Blood 98: 851-859. Shoham, N. G., M. Centola, E. Mansfield, K. M. Hull, G. Wood, C. A. Wise, D. L. Kastner. 2003. Pyrin binds the PSTPIP1/CD2BP1 protein, defining familial Mediterranean fever and PAPA syndrome as disorders in the same pathway. Proc. Natl. Acad. Sci. USA 100: 13501-13506.